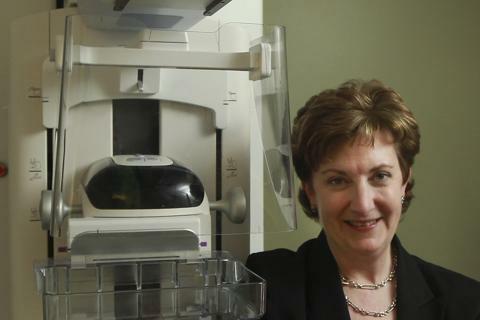 Dr. Elizabeth Rafferty, director of breast imaging at Massachusetts General Hospital, with a tomosynthesis device, which is used to help generate digital 3-D mammograms. With mammograms coming under harsh scrutiny in recent years for failing to detect some breast cancers while also raising false alarms that warrant biopsies, imaging device manufacturers have been racing to get better breast cancer screening tools into clinical practice. So far, a new digital 3-D mammogram — called breast tomosynthesis — has shown the most promise in dramatically reducing the number of women called back for suspicious-looking findings that turn out to be benign and detecting tumors not revealed on the traditional 2-D X-ray. But the potential benefits of the new technology remain up for debate, since it arrives as the value of mammography screening is being questioned. Critics say it prevents only a small number of breast cancer deaths but increases the number of women treated for early non-aggressive cancers that might otherwise have gone undetected and never would have spread. Some cancer specialists, though, have passionately argued against deterring women from breast cancer screening since science can’t determine which cancers might become deadly. For the past eight years, Rafferty has been testing the effectiveness of 3-D mammograms — with funding from Bedford-based Hologic — helping the company gain approval from the US Food and Drug Administration in February 2011 for the first and only breast tomosynthesis device on the market. Mass. General now offers the screening to two-thirds of women who come in for their annual mammograms. Breast tomosynthesis is performed just like a mammogram — with the breast flattened between two plates like a pancake — except the X-ray camera rotates to snap 15 images from all angles. Software designed for the machine synthesizes the images to create a 3-D rendering of the breast that radiologists can examine layer by layer, instead of examining the bird’s eye view from the traditional 2-D X-ray. Women currently need to have both a standard mammogram and a 3-D image — to get a flat picture of the entire breast as well as a contoured view of various layers — which exposes them to twice as much radiation but is still within the FDA’s acceptable safety range. An FDA expert panel voted in October to approve an add-on to the latest Hologic machines that would re-create a 2-D image using just one X-ray scan. Massachusetts General Hospital Imaging has acquired 10 of the 3-D imaging machines for its breast center on the main campus and affiliated radiology centers in Waltham, Chelmsford, Danvers, and Worcester. A handful of community hospitals such as Newton-Wellesley and Lowell General have also recently begun to offer the 3-D screening. Other area teaching hospitals, however, have been slower to adopt the technology, and only about 300 medical institutions nationwide have purchased the device, according to Hologic. That may be related to the cost — $760,000 for the machine and software — and the lack of an insurance code to bill for the additional imaging, which costs $50 per patient beyond standard mammography. Insurers must cover standard mammograms without any copayments. Some hospitals, including Mass. General, don’t charge women for the extra cost of the screening, while others have been able to get reimbursed by billing under a miscellaneous code. Women, though, sometimes get stuck with a bill for $50 after they’ve had the screening. “Medical societies need to see large screening studies to validate the clinical merits of a new technology and based on that might seek an insurance code with the government,” said Peter Soltani, head of the Breast Health division at Hologic. “At this point in time, we’re not there yet.” A large study involving more than 12,000 patients from Norway — where Hologic’s device was approved for use in 2009 — is set to be published early next year and could be the tipping point for insurance coverage if results demonstrate the superiority of 3-D mammograms over standard imaging. Where the technique may prove most useful is for younger women who have dense breasts that make it harder for X-rays to reveal tumors, which are also dense. Five states have passed laws requiring radiologists to inform a woman if she has dense breasts and direct her to ask her doctor whether she needs additional screening or more frequent breast exams. While Massachusetts doesn’t have such a requirement, women like Judith Romano, of Ashland, are often told they have dense breasts, which not only puts them at higher risk of breast cancer but also leads to more frequent callbacks for ambiguous findings. Romano had several anxiety-provoking callbacks during her early 40s until she opted to have a 3-D mammogram when it became available last year at Mass. General, where she works as an executive assistant. “The regular mammogram showed nothing, but the 3-D image found something suspicious,” said the 50-year-old mother of two. A biopsy revealed cancer, which led her to have a double mastectomy along with reconstruction after the initial surgery revealed more cancer cells than originally anticipated. But one researcher, whose study the ad cites, criticized the campaign for overselling an imaging device that’s very new and without a proven track record. In data collected on nearly 5,800 women that will be presented at a radiology conference later this month, Philpotts found that 10 percent of women who had just the standard imaging had to come back for a repeat X-ray compared with 6 percent of those who had both the standard and 3-D mammography. About one-third of the patients who were recalled went on to have a biopsy, which more often than not comes back without any sign of cancer. While 3-D mammograms lower the likelihood of vague-looking findings that require additional imaging, they haven’t been shown to lower the detection of suspicious looking findings such as calcifications that require biopsies — which usually turn out to be benign. The high rate of benign biopsies is considered one of the major drawbacks of standard 2-D mammography. “I don’t think 3-D mammography will have a profound effect on reducing the number of biopsies,” Philpotts said. “If anything, it might increase the rate since it finds more cancers” as well as high-risk breast lesions that require removal before they become cancerous. Whether 3-D mammography will reduce a woman’s risk of dying from breast cancer more than regular mammograms isn’t yet known. A controversial study published in the New England Journal of Medicine a few weeks ago indicated that, while mammography has saved some women’s lives because of early detection, as many as 30 percent of women whose breast cancers are detected on regular mammography have slow-growing cancers that wouldn’t have otherwise been diagnosed and would never have become life-threatening. Having a 3-D screening tool that detects even more breast cancer might simply amplify the trade-offs of mass cancer screening. It could wind up increasing the small number of women whose lives are saved by early detection via mammography by a little bit, while increasing the number of women treated for non-aggressive cancers a lot more, according to study coauthor Dr. H. Gilbert Welch, a professor of medicine at the Dartmouth Institute of Health Policy and Clinical Practice in Hanover, N.H.
For example, those women who are at moderately increased risk for breast cancers — because of dense breasts, or a family history — might gain more benefit from 3-D mammography than women who are at lower risk. Cancer society guidelines recommend screening with expensive magnetic resonance imaging for women at very high risk of breast cancer because they have one of the inherited breast cancer gene mutations. Ultrasound screening could soon become another widespread option for women with dense breasts. Radiologists currently perform a time-consuming ultrasound screening on some women with dense breasts using a hand-held device that requires a technician’s expertise. But a new automated ultrasound device that received FDA approval in September for women with dense breast tissue could make this screening easier. Like 3-D mammography, it also reduces the callback rate for false findings and has the potential to find cancers earlier. So far, the technology hasn’t become available in the Boston area, but GE Healthcare acquired the company that makes the device last month and projects sales of 5,000 scanners nationwide within the next several years.